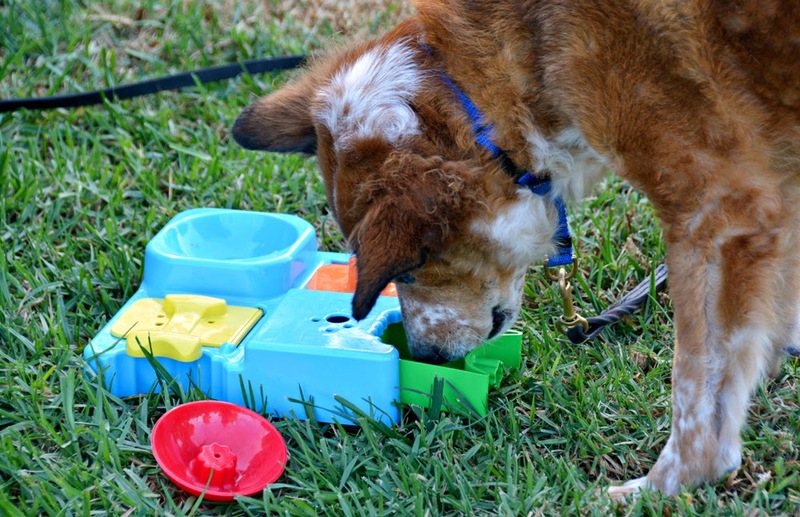 The Dog Geek: Puzzle Toy Review: Toys'R'Us Treat Puzzle Dog Toy "The Everything Puzzle"
Puzzle Toy Review: Toys'R'Us Treat Puzzle Dog Toy "The Everything Puzzle"
The Toys'R'Us Treat Puzzle Dog Toy is a board game style puzzle toy sold exclusively at PetSmart. It features four treat compartments that each open in a different way, and for this reason I have dubbed it "The Everything Puzzle". 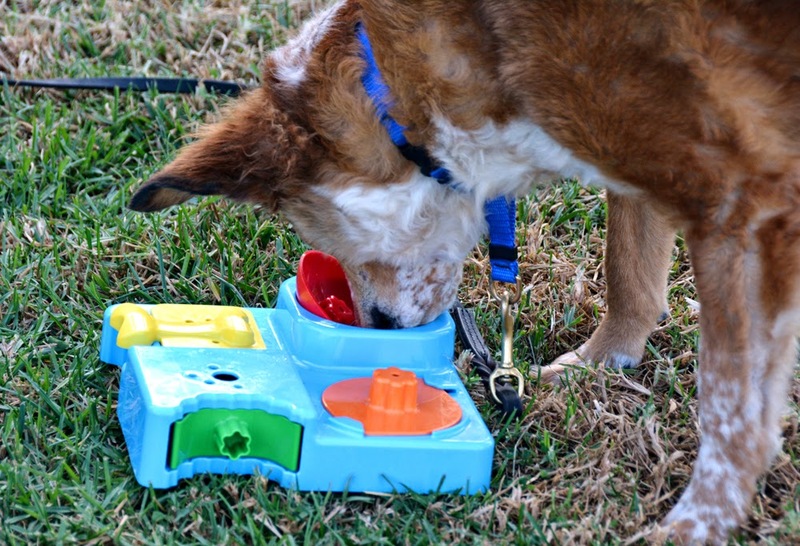 It needed a name, too, because PetSmart currently has three different Toys-backwards R-Us treat puzzles available on their website, with nothing to differentiate them from one another either in the name of the product or the packaging itself. Toys sold under the Toys-backwards R-Us brand have been appearing at PetSmart for a while now, and they often seem to be familiar toys with a new label. 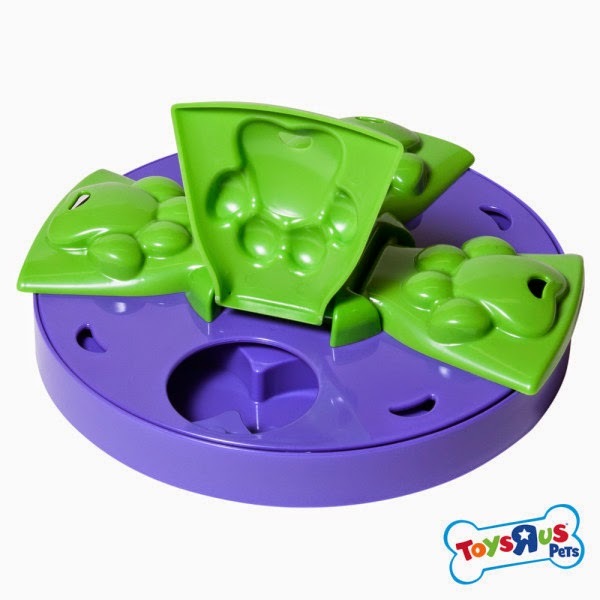 Check out this Treat Puzzle Dog Toy, for example. Doesn't it have an uncanny resemblance to Kyjen's Paw Flapper. It's obviously the same toy, and PetSmart has likely licensed both the toy design and the Toys-backwards R-Us logo. Kyjen doesn't have anything like the Everything Puzzle, though. This one is both unique and challenging. The four treat compartments each open in a different way. There is a yellow door, a green drawer, an orange disc, and a round red plug. The orange disc sits firmly under two little flaps, and must be both spun and slid for removal. The red plug is round on the bottom and sits in a round depression with a little treat cavity below. 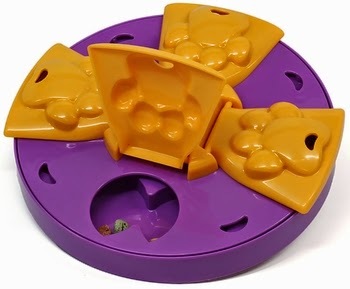 Rather than reinforcing puzzle-solving skills by having the dog repeat a task several times, this toy requires four separate actions to defeat. It is difficult to open just by shaking, kicking, or even flipping the whole thing. This makes it a great challenge for Brisbane. I can fit at least half a cup of food in here, probably closer to a whole cup. That drawer in particular is quite roomy. Open compartments, dump in food, close compartments. I'm not sure Uly would figure this out given an entire day to ponder. Brisbane spent a good ten minutes getting a quarter cup of kibble out of The Everything Puzzle even though he had seen it before. 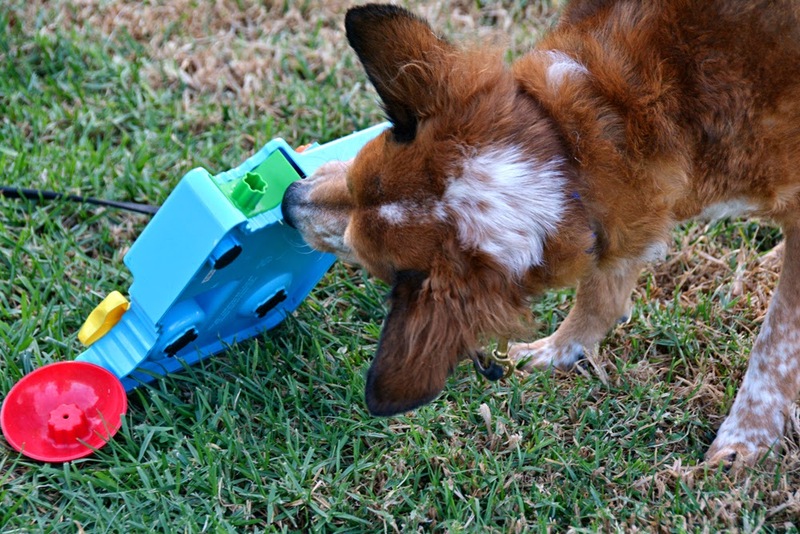 The pegs on most of the parts of this puzzle would be difficult for a dog with larger mouth. Brisbane has a little bit of trouble with them, I'm sure a large or jowly dog would fair much worse. At the same time, I think that Ru would have a tough time spinning the orange disc or opening the drawer with his tiny mouth and utter lack of strength. This puzzle is made for use under close supervision and won't hold up to much chewing, but it also feels pretty darned sturdy. There is no thin or bendable plastic in this puzzle. It can be a little rattly when Brisbane is kicking it across a hard floor, but overall it's not bad. Close supervision means never having to look under the furniture for this toy. I'm pretty sure those removable red and orange parts would disappear in some households though. No stealing and no moving means no hoarding. Hard plastic should make for easy cleaning, but I'm pretty sure there's no way I could clean the space behind that green drawer. I think this is my favorite board game so far.